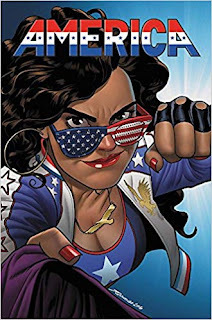 “I didn’t feel invited in.” “I would have liked them to explain cultural terms.” I’ve encountered a lot of that lately from white men, with both Arigon Starr’s Super Indian and Gabby Rivera and Joe Quinones’ America. Mostly, after I or some third party brought up the comic. And in most cases, I think it is acceptable and non-bigoted. To paraphrase, as a response, Dr Frank N Furter’s, “I didn’t make him for you!” Every comic has a target audience, a hypothetical most-likely-reader. Super Indian and America are not aimed first at white men. Neither is actively firewalling white guys, barring them from functional entry, but their hypothetical needs as an audience don’t come first. If an audience is used to being prized above all others, not having that service can feel like a fence, like a rejection. Unless the field is near-unilaterally walled against a demographic, however, it’s not. When the door pulls open, people who pull to open may get in quicker, easier, but people who push to open, will and can eventually also get in. Three second difference. Still a door. Technoskin, a giant robot Indian, is not going to be introduced in Super Indian with a “footnote: ‘skin’ means Native American,” because it is understood that the primary audience understands the reference. Why the university, in America, is Sotomayor University, or what an Indigenous Studies department is, may not warrant a footnote or explanatory dialogue. People, in the story, and in the principle audience, know. There is an early issue of X-Men vol 2, that makes reference to “brass,” in the sense of, “the man is all brass,” that as a 6th grade kid, I significantly misunderstood. Nobody I knew used the phrase, I’d never been educated on the phrase. But, that is the tail end of Chris Claremont’s decades-long run on X-Men comics, and I was not his target audience. I was not the target, not the bread and butter. Even when Native characters showed up, or characters my age, I was not the target audience. Dani Moonstar was not written or drawn for a young Native audience in New Mutants or other X-titles. Not under Claremont and Bill Sienkiewicz, not later, by Matt Fraction and Greg Land. “Warrior of the Cheyenne" is appended to Dani the way, “powerful beams shoot from his eyes" is, to Cyclops, or, “controls weather,” to Storm. Nobody says, “white warrior,” of Psylocke, with her “focused totality of… psychic powers” pink telepathy knife that grows out of her hand. “Warrior of the Polish Americans” is applicable, logically, to any Polish-descent American X-Man, but you’ll never see it, if not satirically, because a white American audience is assumed. You have to prove that Dani isn’t white and American, you have to prove that Wolverine isn’t American. Other demographics do it, too. There are levels of self-absorption in all walks, all types. But, with other groups, it tends to be, so to speak, a minority of the minority. The majority of those audiences know they are not going to be served first, that some of the work may be on them, even in terms of slang or famous figures. Different anglophone cultures and subcultures do not share the same touchstones. They do not need to, and no one culture/subculture’s are more real or central than any others’. Women have communities that are not predicated on men. Black women in America have different communities, and thereby a different dialect of reading, a different lens to look through, than black women from England. 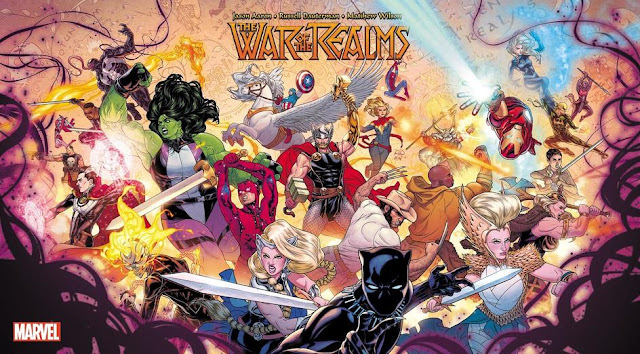 The touchstones included in a comic reveal the primary, the most important audience. If the touchstone for “tough black man” is Jim Brown, at least someone’s age is showing, the author and/or the primary audience. Jim Brown is not a twelve year-old’s point of reference in 2018. “Stone butch,” “lala,” and, “yuri,” are near-synonymous terms in the right circumstances, but are neither interchangeable, nor targeted to the same primary audience. Someone opened and email to me, earlier, with, “My lala sister,” and as an interpersonal exchange, it makes sense, and hey, I’ll take it. But, if you open a comic that way, you’re addressing a more clear-cut and anticipatory primary audience. If you put that scene in a comic, without further elaboration, even to an audience who understands the reference, it is going to seem odd. Odd in the way Dani Moonstone’s continual label, self-selected and by omniscient narrator, as a “Cheyenne warrior,” to the expense of all else, reads weird to a Native audience. No matter how comfortable a white woman or a Chicano man may be, being called any variant of n*****, to an outside audience, questions, generally, will arise. I think, in America, the deployment of a character actually named “Goodhair,” and written off as “Becky,” by the title character, is a misstep, mainly because she’s actually right in her concerns, and the narrative backs that up. But, I also recognize that it does not matter if I think it is a misstep, because I and my interpretation of the narrative are not the authors’ primary concern. I am not their first, their primary audience. The reference is not for me. And, at least, I suppose, I get the reference. So, I’m already more in than I was when someone said Gambit was “brass,” and I thought it meant he could turn into metal like Colossus. Either way, they can afford to lose me for one scene, if not financially, then ethically and aesthetically. Yes, America was canceled after twelve issues, but I wouldn’t doubt it was only ever contracted and scheduled for twelve issues. Most of the “cancelations” today are not due to low sales or lack of positive reception, but because they have enough to collect and keep in print in perpetuity. Super Indian can afford to not target the largest potential demographic first, because, honestly, they are both unlikely to ever go all in on the property and the largest potential demographic simply is not as important as the one the comic is actually aimed at. 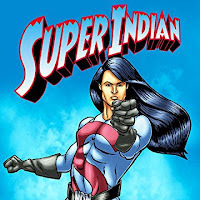 We, the Native community, especially the Native comics community, need Super Indian. We need its satire, its casual soap; we lack options and it’s good. The second bus to come along is usually just as good as the first, but you have to wait. Sometimes, to get on the first bus, people will only ever travel in the cheap seats, or they stand the entire trip, and try not to stumble too often. They might sit on the edge of step or perch on a luggage rack. Rather than limiting the field or blocking readers, having a field that comprises myriad target audiences, instead of a uniform, even one mistakenly assumed to be “universal” target, broadens the entire field, serves more people, deepens and enlivens our pool of resources. And, in having at least one comic talk directly to a person, to them first, encourages them to try more comics, and also to more readily recommend them to people they think that comic will also engage. Three buses go along that explicitly don’t want you, or feel intimidating enough you don’t step on, it may seem like the fourth will only be the same. People get tired. When audiences tire, they dissipate. A white, American, heterosexual, male-IDing audience, for anglophone comics, will never dissipate. There will always be buses. There will be fleets and the ads on the sides of them will target, too. That’s acceptable. Everyone else needs a bus, too, and we don’t all need the same rickety, fourth one in line. America and Super Indian are comics that feel like the first bus in the line has pulled up, opened its doors, and even turned on a welcome sign. They don’t even check your ticket.